It’s been a month since I wrote Part I of my series on Oak Hill and I apologize for the delay on Part II. Summer means the kiddo is out of school so my schedule gets a bit crazy. You can’t visit Oak Hill Cemetery without noticing all the soldiers’ graves. The Confederate Cemetery area of Oak Hill (near the entrance) contains 268 graves, with soldiers from every Confederate state represented. All told, there may be more than 1,000 veterans total (from all wars) buried at Oak Hill. How did that happen? 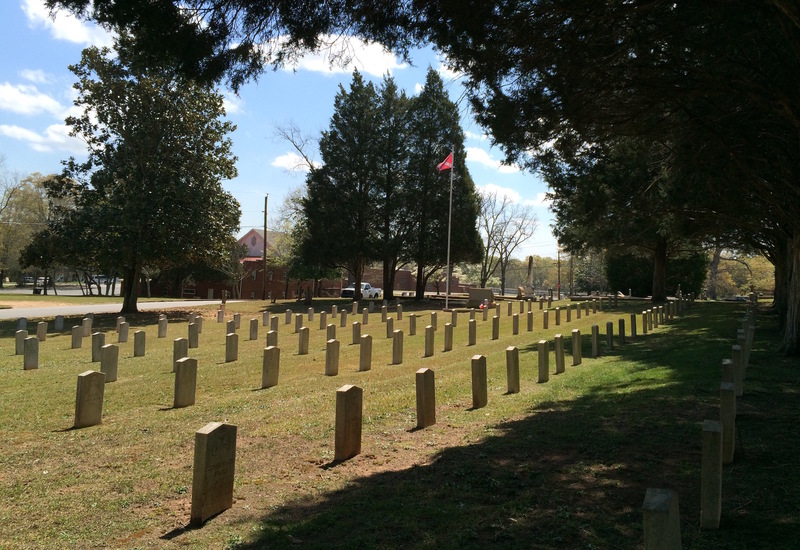 Oak Hill’s Confederate Cemetery contains a fraction of the over 1,000 veteran graves there. Other Confederate graves are scattered throughout the cemetery. By 1860, nearly a thousand people were living in Newnan and several had built spacious new houses on the streets around the courthouse. Because of its strategic position on the West Point Railroad, Newnan became the site for several Confederate military hospitals. The first surgical teams arrived in 1863 and took over most of the larger buildings in the town. In time 10,000 soldiers were housed in seven separate field hospitals scattered about town. The Battle of Brown’s Mill took place near Newnan on July 30, 1864, between Union Brig. Gen. E.M. McCook’s 3,600 men and Confederate Maj. Gen. “Fighting” Joe Wheeler’s 1,400 men. Wheeler routed the Union forces, capturing 2,000 and releasing 500 Confederate prisoners captured days earlier by Gen. Edward McCook in Fayetteville (just down the road in my hometown). McCook was participating in the Great Cavalry Raid, Gen. William T. Sherman’s plan to destroy railroads south of Atlanta. McCook was to swing around the west side of Atlanta and Stoneman around the east, where they would meet in Lovejoy, then tear up track to Macon. McCook got to Lovejoy, but Stoneman was not there. 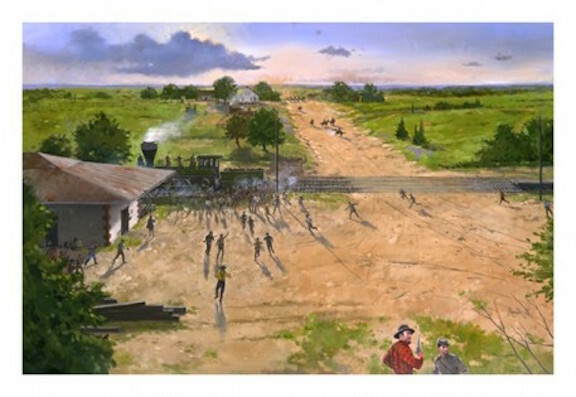 When Wheeler’s men drew near, McCook turned back toward Newnan so the town was spared capture and possible destruction. As a result, Newnan is known as the City of Homes because of its outstanding examples of period and contemporary architecture. More than 22 antebellum homes are found here in five National Register Historic Districts. I’ll talk about one of them in Part III. 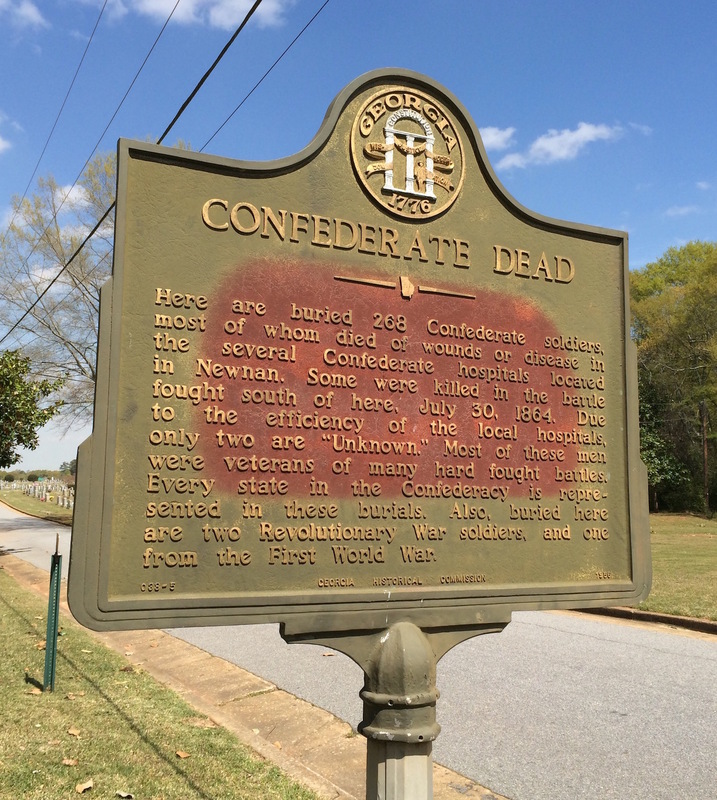 Regarding the Confederate burials at Oak Hill, while many soldiers’ remains were sent home to be buried by their loved ones, others were buried in Newnan. Not all died from battle wounds but many from disease. This sign marks the Confederate Cemetery section of Oak Hill. 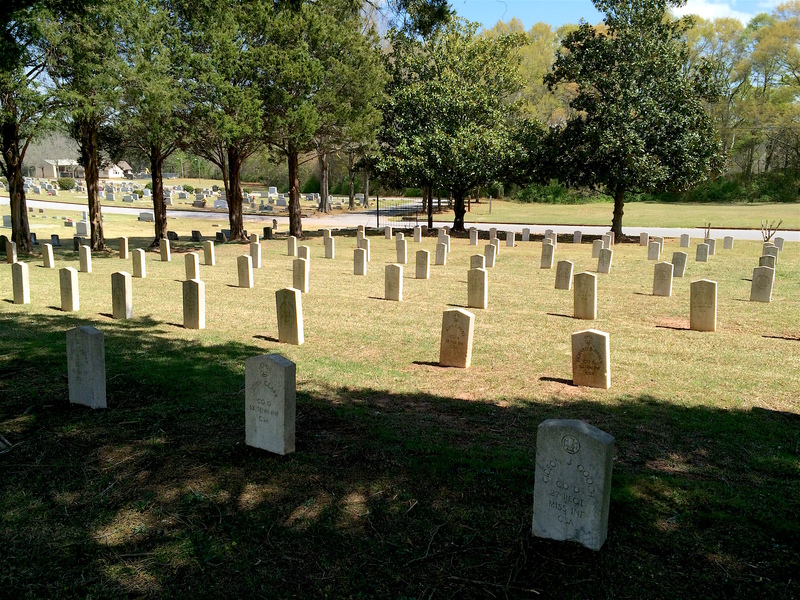 In 1868, the Ladies Memorial Association was key in marking the graves of those who died during the Civil War in Newnan. Later, the local United Daughters of the Confederacy maintained the lots and new markers were made available in 1950 by U.S. Representative Sid Camp. Thanks to well-kept records, every Confederate soldier was identified except for two. More often than not, the men buried in the Confederate Cemetery lived humble lives and not much is known about them beyond their name and what company they served in. A good example of this is W.R.F. 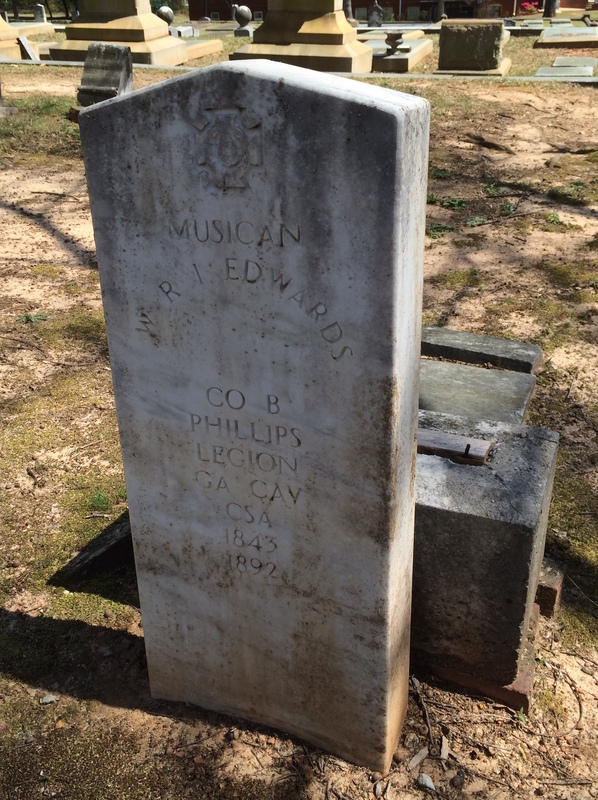 Edwards, a musician who served in Company B of Phillips Legion as part of the Georgia Cavalry. I could find little more about him. Little is known about W.R.I. Edwards, who served in Phillips’ Legion as a musician. 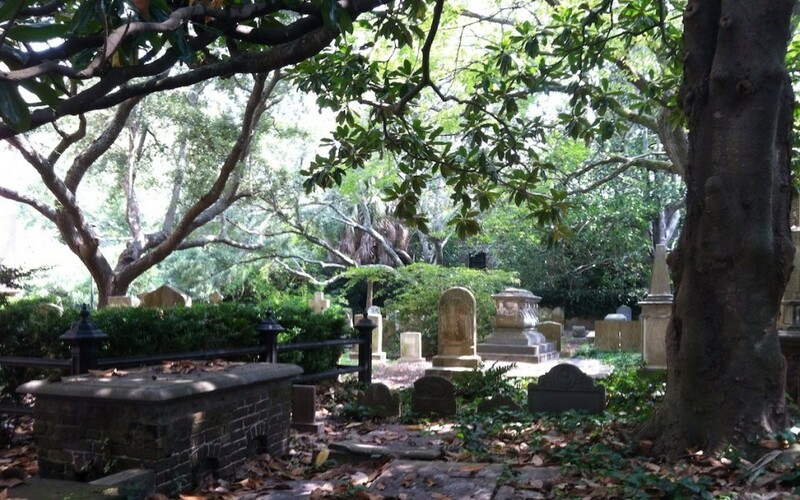 Within the Confederate Cemetery are two graves of Revolutionary War veterans James Akens and William Smith. Akens was a native of South Carolina who married a Georgia bride. Like Akens, Smith served in the North Carolina Militia. Akens and Smith both served in the North Carolina Militia. Although he’s not buried in the Confederate Cemetery area, Private William Thomas Overby, known as the Nathan Hale of the South, is at Oak Hill. Captured by Union soldiers, generals offered Overby his life in exchange for information on the location of his unit. He refused and was executed. In 1997, his grave was relocated from Virginia to Georgia. I didn’t know he was buried at Oak Hill when I visited, so I missed photographing his grave. One Confederate grave I noticed in my ramblings in another part of the cemetery was quite humble and in need of repair. I photographed it, knowing I’d find out more about him later. Indeed I did. Capt. 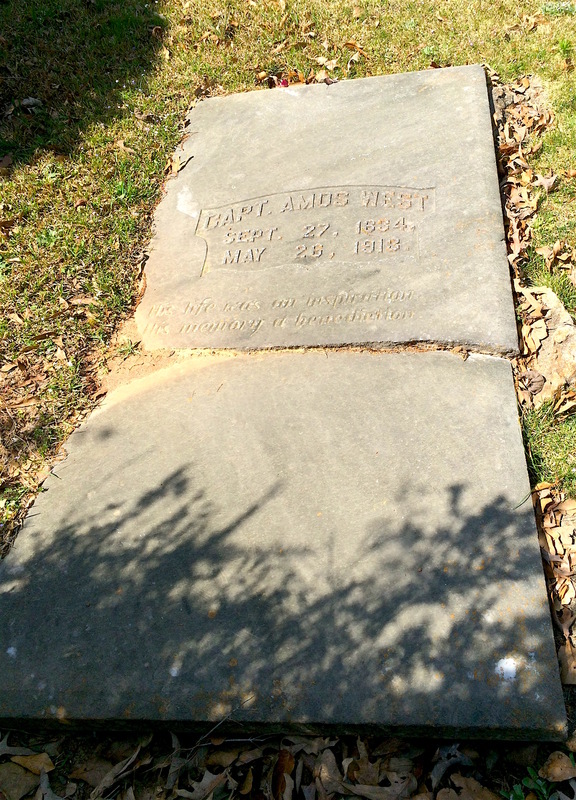 Amos West was wounded in the chest at Hartsville, in the leg at Chickamauga and in the arm at Intrenchment Creek. Despite his wounds, he stayed with the Orphan Brigade until the war’s end. A native of Graves County, Ky., Amos West was a member of the Confederate Orphan Brigade, having joined Company D of the 2nd Kentucky Infantry in 1861. He served as an orderly sergeant but was later promoted to lieutenant after serving with gallantry at the Battle of Stone’s River near Nashville, Tenn. I visited the cemetery at the battle site a few years ago. His obituary notes that wounds he suffered in three different battles would have given him opportunity to be discharged. But each time, Capt. West refused and stayed with his company until Lee’s surrender, fighting in battles at Chickamauga, Resaca and Atlanta. He returned to Kentucky after the war but moved to Newnan many years later. He died at his daughter’s home in 1913. After the Civil War, Amos West returned to Kentucky and married. He became a tobacco merchant and raised a family with his wife, Olivia. He moved to Newnan to live with his daughter, Amie, before he died in 1913. I recently learned about a local project called Never Forgotten headed by Newnan resident Beth Carroll that aims to honor local veterans (from all wars) and keep their memory in the public eye. 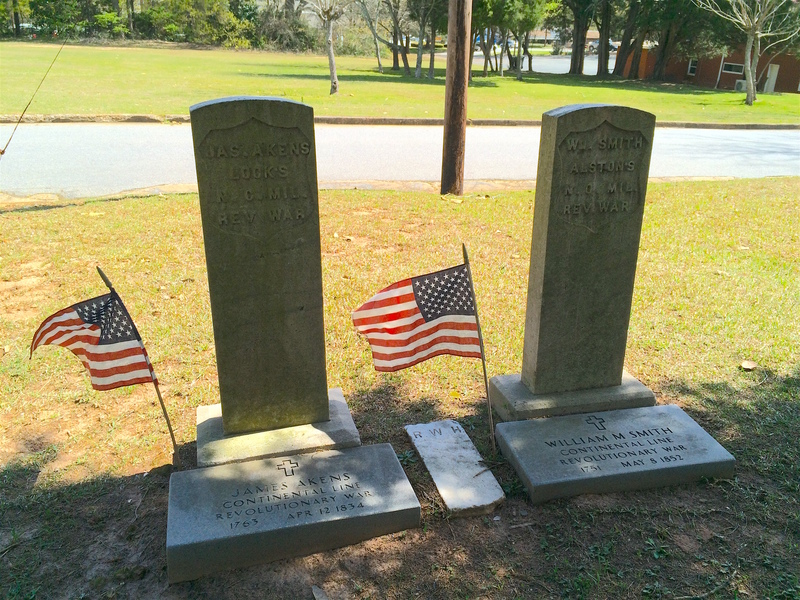 She and others (including the Newnan High School Historical Society) are working to document veteran graves, and raise funds to restore and repair them. The first one on the list is Capt. West’s grave. The son of a Newnan attorney, Capt. 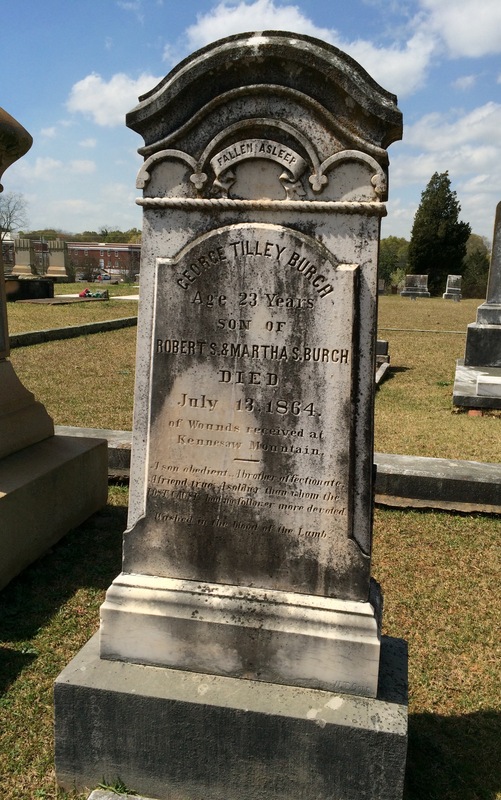 George Tilley Burch was in temporary command of the 29th Ga. Infantry when he was wounded. Capt. Burch was in temporary command of the 29th during the Battle of Kennesaw Mountain on June 27, 1864. According to the memorial, both of Burch’s knees were wounded during a charge. He died a few days later on July 13, 1864. Capt. Burch’s sister, Isora, is buried nearby with her husband, Robert Henry Hardaway. 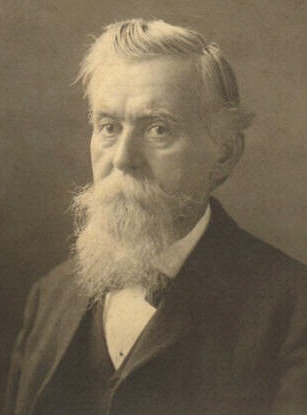 He, too, served in the Confederate Army in the Georgia First Cavalry, Company R. A successful businessman, Hardaway owned a mercantile, was a bank president and served in the Georgia Senate from 1900-1901. I especially like the epitaph on his stone from Isaiah 26:19. “Awake and sing, ye that dwell in the dust,” comes from Isiah 26:19. 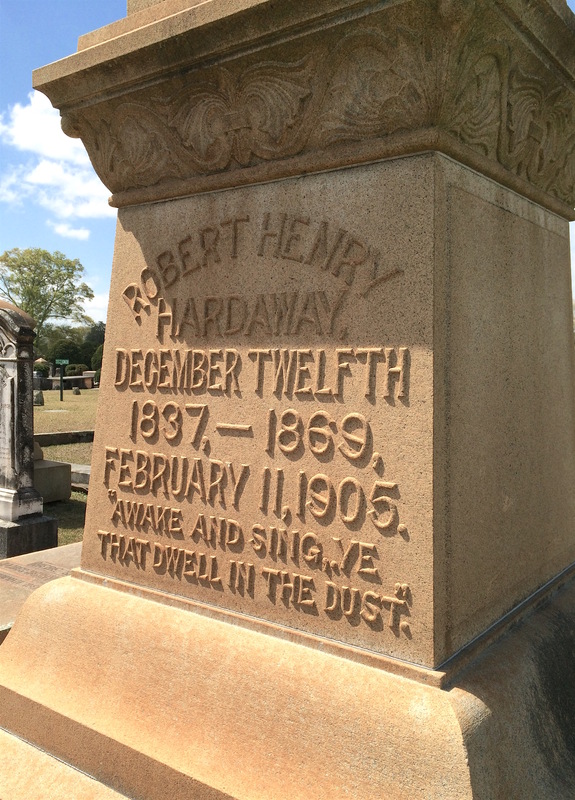 You might notice there are three dates on Hardaway’s monument: 1837, 1869 and 1905. The middle date, Dec. 12, 1869, had me puzzled. Why? Thanks to the research of Walter Stephens, I found out that it was the year he married Isora. It’s also his birthday. Their daughter, Jennie Hardaway McBride, also has her wedding date on her grave marker. 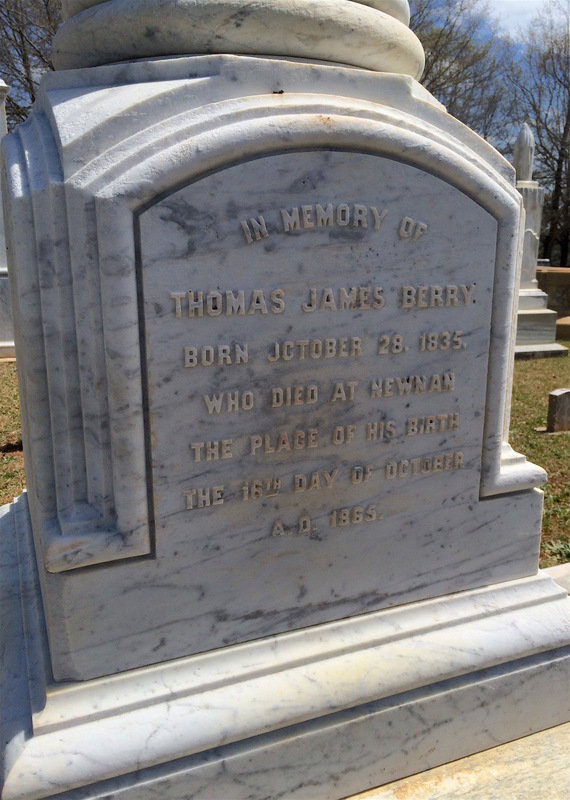 Among the grander monuments is one for Lieutenant Col. Thomas James Berry. 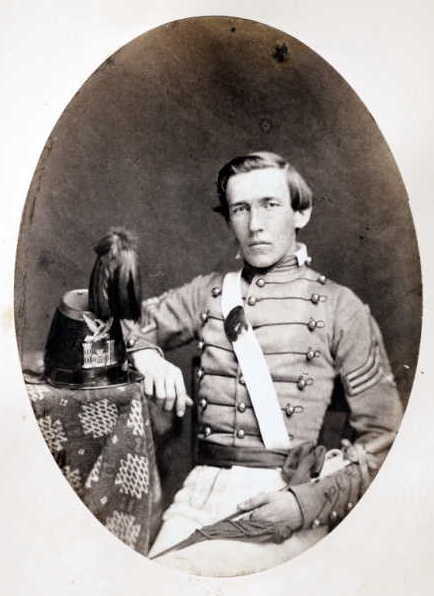 Berry stands apart because he made the military his career long before the Civil War, graduating from West Point in 1857. He was promoted to Second Lieutenant before being send to frontier duty as part of the Utah Expedition at Ft. Kearney, Neb. until he resigned his commission in 1861 to enlist in the Confederate Army. Thomas Berry’s brother, Joel, served in the Confederate Army in Phillips’ Legion but was charged with desertion. Joel died in New York City in 1869 and is buried between two of his brothers at Oak Hill. According to Southern Historical Society Papers, Berry was a major and later a Lieutenant Colonel in the 60th Georgia Infantry. The 60th took part in several battles, including Chancellorsville and Gettysburg. He was wounded many times over the course of his service, eventually having to retire and return to Newnan in January 1865. He later died on October 16, 1865 at the age of 30. Thomas James Berry’s military career took a turn when he resigned his commission to join the Confederate Army. Next time in Part III, I’ll talk about some of Newnan’s more prominent families like the Parrotts and Bigbys. I so enjoy reading your documentary’s and bringing back to life people. Please keep up your wonderful work. Thank you, Jay! Glad you enjoy them!